This poem is based on encouragement from one Robin Kalinich who is participating in the National Poetry Month challenge. The challenge as to ask people to answer 5 questions and put together a poem based on those answers. 2. How do you recognize true love? 4. Do you always finish every book you begin? Why or why not? 5. List your three favorite words. So quiet she can hear the snow patter the ground. He hangs from the windowsill she stared out for years. I can’t help but think our love faded. sputtering a young love of long ago. without counting fingers, looking at the wall. staring at a different, more refined woman. smile – daring me to take her home. and hold her till our arms are numb. faded into a something deeper, stronger. me to tell my story again. Stinging in my chest continued. gives me. It’s easy to spot. Father left satisfied. So did Somani. “Why won’t you let me in? Why do you have to be so negative? The phone rang. Mother answered. “This is Margaret. No. I can talk. It’s just my ungrateful child. Think they call it Emo. feeds whatever’s growing in my chest cavity. said what they wanted. Teachers heard nothing, saw less. or whispering in my ear. “SHAKE.” I shook. “You can leave,” she told him. Inspiration for this came from a song. Now I can’t remember which one. Think it was a Depeche Mode song I heard on the radio that brought it on. of who I was or thought I was. Now my voice is heard. I hold my head up high. I take one the world with biting accuracy. The world belongs to me. but I make her so miserable. how much I love my beautiful martyr. NOTICE: The image is not mine. 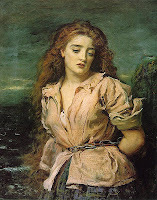 It is a famous painting: The Martyr of the Solway by Millais. But I thought it was was gorgeous and so fitting. While waiting for my writing critique group last night, I wrote this little poetry gem. My love for him is unbending. Hold hands when nobody’s eyes burn our skin. Their words remind us every day. And because I’m married to Heather Isabella Mandel. At More Ink, we did two exercises of similar caliber. The outcome of the first was in an earlier post. The latter is below. To my More Ink brethren, the words have been edited, but only mildly, yet still contain all the words I had to use in the exercise. To everyone else, below is simply another reason to love, or hate, poetry. Yesterday I was a black box. every tick of daily life. Today that origami clock no longer tocks. This poem took several days to write. I’m not fully satisfied with it, but there it is: my third attempt at poetry. It still has a story (something missing from most poetry). It still has at least two layers. For the few readers I have, please give me feedback on this one. It’s missing something but I’m not sure what it is. gave me. It’s easy to spot. Frank, the school is aware of the problem and working on it. Father left satisfied, so did Somani. Mother asked how my day went again. Fine. Details? No thank you. Why won’t you let me in? Why do you have to be so negative? you can just spend the night in your room. This is Margaret. No. I can talk. he doesn’t mean it. Do you mean it? I do. See, he does. He said that to you five times already. Shake. No. Shake his hand. No. he recognizes his mistake. You don’t get it. SHAKE. I shook. You can leave, she told him. She told me, you have detention.